Even low doses of toxic chemicals in the environment pose a significant risk to cardiovascular health, according to a report in today’s edition of The BMJ, led by researchers at the University of Cambridge. The researchers have also challenged the omission of environmental risk factors such as toxic metal contaminants in water and foods from the recent World Health Organization report on non-communicable diseases (NCDs). In recent decades, exposures to environmental toxic metals such as arsenic, copper, lead, cadmium and mercury, have become a global public health concern. Although often naturally occurring, these contaminants have made their way into water supplies and, via irrigation, into the food chain. For example, in Bangladesh, deep wells were introduced in the Ganges Delta to draw water clear of bacterial and viral pathogens, but this inadvertently led to exposure to toxic metals. Worldwide, those at greatest exposure of arsenic, lead, cadmium and copper were around 30% to 80% more likely to develop cardiovascular disease than those at lowest exposure. The report is important, say the researchers, because it highlights the need to tackle this environmental and public health problem, one which disproportionately affects people in low and middle income countries, though may still affect those in higher income countries. Interventions need not be costly, they stress; for example, cheap, scalable technologies (e.g. environmentally-friendly water filters) or behavioural interventions (e.g. rinsing practices of rice and vegetables prior to cooking) are currently being tested to reduce exposures at the household level. Dr Chowdhury and colleagues recently also received £8.1 million from the UK Research Councils’ Global Challenges Research Fund to set up a long-term programme (called CAPABLE) to further investigate environmental factors of cardiovascular diseases and to help inform preventative strategies. 2006 was a year of “life-changing events” for Dr Rajiv Chowdhury: not only did he receive a Commonwealth scholarship to study for a masters at Cambridge, but his wife also gave birth to their baby daughter. Rajiv grew up in Bangladesh, where he studied medicine before moving to Cambridge for his masters. This made him acutely aware of the challenges facing low-income countries. “I could see for myself the massive inequalities, the huge burden of disease, the poor infrastructure, lack of resources…” he says. But it was his encounter with non-communicable diseases (NCDs) – conditions such as heart disease, cancer and type 2 diseases – that was to have particular relevance to his current work. 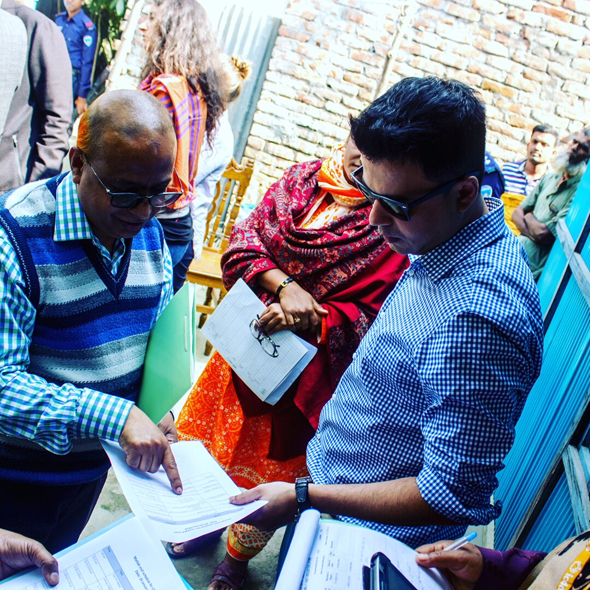 Following his masters, Rajiv went on to receive a Gates Cambridge scholarship to support his PhD in epidemiology – the first Gates Cambridge scholar from Bangladesh. He now studies the role played by both environmental factors (such as toxic metals, diet, etc.) and genetic factors in influencing the risk of chronic NCDs. Rajiv’s particular interest involves working closely with researchers in low-income countries such as Bangladesh, Sri Lanka and Malaysia – as well as being the principal investigator on several international research projects, he is also Scientific Director for CAPABLE (Cambridge Programme to Assist Bangladesh in Lifestyle and Environmental risk reduction), funded through the Global Challenges Research Fund. Filter bed beside Afon Rheidol Water draining from an adjacent disused silver-lead mine is passed through these filter beds so as to allow the toxic heavy metals to settle out, thereby reducing pollution of the river.